This page explains how to configure your DNS Pod and customize the DNS resolution process. In Kubernetes version 1.11 and later, CoreDNS is at GA and is installed by default with kubeadm. See Configuring CoreDNS and Using CoreDNS for Service Discovery. Kubernetes version 1.6 or later. To work with CoreDNS, version 1.9 or later. The appropriate add-on: kube-dns or CoreDNS. To install with kubeadm, see the kubeadm reference documentation. DNS is a built-in Kubernetes service launched automatically using the addon manager cluster add-on. As of Kubernetes v1.12, CoreDNS is the recommended DNS Server, replacing kube-dns. However, kube-dns may still be installed by default with certain Kubernetes installer tools. Refer to the documentation provided by your installer to know which DNS server is installed by default. The CoreDNS Deployment is exposed as a Kubernetes Service with a static IP. Both the CoreDNS and kube-dns Service are named kube-dns in the metadata.name field. This is done so that there is greater interoperability with workloads that relied on the legacy kube-dns Service name to resolve addresses internal to the cluster. It abstracts away the implementation detail of which DNS provider is running behind that common endpoint. 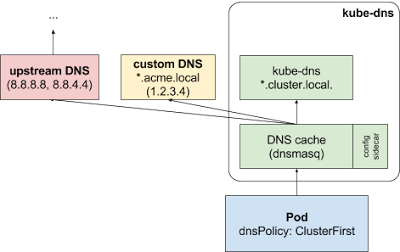 The kubelet passes DNS to each container with the --cluster-dns=<dns-service-ip> flag. DNS names also need domains. You configure the local domain in the kubelet with the flag --cluster-domain=<default-local-domain>. The DNS server supports forward lookups (A records), port lookups (SRV records), reverse IP address lookups (PTR records), and more. For more information see DNS for Services and Pods. If a Pod’s dnsPolicy is set to “default”, it inherits the name resolution configuration from the node that the Pod runs on. The Pod’s DNS resolution should behave the same as the node. But see Known issues. If you don’t want this, or if you want a different DNS config for pods, you can use the kubelet’s --resolv-conf flag. Set this flag to “” to prevent Pods from inheriting DNS. Set it to a valid file path to specify a file other than /etc/resolv.conf for DNS inheritance. CoreDNS is a general-purpose authoritative DNS server that can serve as cluster DNS, complying with the dns specifications. CoreDNS is a DNS server that is modular and pluggable, and each plugin adds new functionality to CoreDNS. This can be configured by maintaining a Corefile, which is the CoreDNS configuration file. A cluster administrator can modify the ConfigMap for the CoreDNS Corefile to change how service discovery works. In Kubernetes, CoreDNS is installed with the following default Corefile configuration. errors: Errors are logged to stdout. health: Health of CoreDNS is reported to http://localhost:8080/health. kubernetes: CoreDNS will reply to DNS queries based on IP of the services and pods of Kubernetes. You can find more details here. The pods insecure option is provided for backward compatibility with kube-dns. You can use the pods verified option, which returns an A record only if there exists a pod in same namespace with matching IP. The pods disabled option can be used if you don’t use pod records. Upstream is used for resolving services that point to external hosts (External Services). prometheus: Metrics of CoreDNS are available at http://localhost:9153/metrics in Prometheus format. proxy: Any queries that are not within the cluster domain of Kubernetes will be forwarded to predefined resolvers (/etc/resolv.conf). cache: This enables a frontend cache. loop: Detects simple forwarding loops and halts the CoreDNS process if a loop is found. reload: Allows automatic reload of a changed Corefile. After you edit the ConfigMap configuration, allow two minutes for your changes to take effect. loadbalance: This is a round-robin DNS loadbalancer that randomizes the order of A, AAAA, and MX records in the answer. You can modify the default CoreDNS behavior by modifying the ConfigMap. CoreDNS has the ability to configure stubdomains and upstream nameservers using the proxy plugin. If a cluster operator has a Consul domain server located at 10.150.0.1, and all Consul names have the suffix .consul.local. To configure it in CoreDNS, the cluster administrator creates the following stanza in the CoreDNS ConfigMap. In Kubernetes version 1.10 and later, kubeadm supports automatic translation of the CoreDNS ConfigMap from the kube-dns ConfigMap. “kubedns“: watches the Kubernetes master for changes in Services and Endpoints, and maintains in-memory lookup structures to serve DNS requests. “dnsmasq“: adds DNS caching to improve performance. “sidecar“: provides a single health check endpoint to perform healthchecks for dnsmasq and kubedns. Cluster administrators can specify custom stub domains and upstream nameservers by providing a ConfigMap for kube-dns (kube-system:kube-dns). DNS requests with the “.acme.local” suffix are forwarded to a DNS listening at 1.2.3.4. Google Public DNS serves the upstream queries. See ConfigMap options for details about the configuration option format. Custom upstream nameservers and stub domains do not affect Pods with a dnsPolicy set to “Default” or “None”. If a Pod’s dnsPolicy is set to “ClusterFirst”, its name resolution is handled differently, depending on whether stub-domain and upstream DNS servers are configured. Without custom configurations: Any query that does not match the configured cluster domain suffix, such as “www.kubernetes.io”, is forwarded to the upstream nameserver inherited from the node. The query is first sent to the DNS caching layer in kube-dns. Names with the cluster suffix, for example “.cluster.local”: The request is sent to kube-dns. Names with the stub domain suffix, for example “.acme.local”: The request is sent to the configured custom DNS resolver, listening for example at 1.2.3.4. Names without a matching suffix, for example “widget.com”: The request is forwarded to the upstream DNS, for example Google public DNS servers at 8.8.8.8 and 8.8.4.4.
stubDomains (optional) A JSON map using a DNS suffix key such as “acme.local”, and a value consisting of a JSON array of DNS IPs. The target nameserver can itself be a Kubernetes Service. For instance, you can run your own copy of dnsmasq to export custom DNS names into the ClusterDNS namespace. upstreamNameservers (optional) A JSON array of DNS IPs. If specified, the values replace the nameservers taken by default from the node’s /etc/resolv.conf. Limits: a maximum of three upstream nameservers can be specified. Note that the cluster administrator does not want to override the node’s upstream nameservers, so they did not specify the optional upstreamNameservers field. CoreDNS supports the features of kube-dns and more. A ConfigMap created for kube-dns to support StubDomainsand upstreamNameservers translates to the proxy plugin in CoreDNS. Similarly, the Federations plugin in kube-dns translates to the federation plugin in CoreDNS. To migrate from kube-dns to CoreDNS, a detailed blog is available to help users adapt CoreDNS in place of kube-dns. A cluster administrator can also migrate using the deploy script.